A dispute has arisen over the legal ownership of a Time Capsule uncovered during the demolition of the historic Brashear Telescope Factory building on Pittsburgh's North Side. Although the City of Pittsburgh has owned the land and building since 2012, the Jadell Minniefield Construction Company believes the emergency city demolition contract allows them to keep all salvageable materials from the demolition. The Brashear Telescope Factory building, built in May of 1886 near the site of the original Allegheny Observatory and added to the National Register of Historic Places in 2012, was originally the home of the John A. Brashear Company which had manufactured hundreds of telescopes and precise scientific instruments for observatories and scientific institutions throughout the world, in the latter part of the nineteenth century and the first half of the twentieth century. Demolition of the historic Brashear Telescope Factory building, which had been vacant for about 20 years, was necessitated after a wall of the building collapsed onto a nearby two-floor apartment building. The apartment building had to be evacuated, until city inspectors declared the building safe for occupancy. The wall collapse had occurred on March 16, with demolition of the rest of the building beginning the next day. When the author and editor of this SpaceWatchtower blog, Glenn A. Walsh, viewed the site on the evening of the Vernal Equinox (March 20, the official beginning of the season of Spring), the majority of the building had been brought-down, with the exception of small portions of the north and south walls. In a March 24 electronic mail message, Antique Telescope Society member Al Paslow reported that the demolition was completed, and the site has been covered in straw, as of Tuesday afternoon (March 24). The demolition crew reported to have found the Time Capsule on March 22, while bringing down the last wall, on the north side of the building. They were unsuccessful in attempts to contact the city and the Heinz History Center regarding the find. 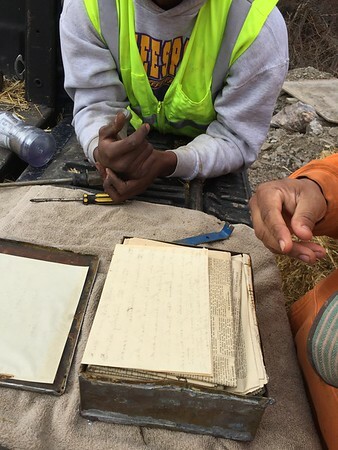 So, on Tuesday when Al Paslow visited the demolition site, it was decided to open the Time Capsule and photo-document the contents. On Wednesday morning, shortly after the SpaceWatchtower blog published the story of the finding of the Time Capsule, Matthew S. McHale, Assistant City Solicitor for the City of Pittsburgh Department of Law, sent an electronic mail message to SpaceWatchtower Editor Glenn A. Walsh seeking information on the whereabouts of the Time Capsule and contents. By early afternoon, Mr. Walsh had confirmed that the demolition company retained possession of the Time Capsule and contents, thanks to the assistance of another member of the Antique Telescope Society, Janet Gunter (who also serves on the Boards of the Perry Hilltop Citizens' Council and the Allegheny City Society historical association). Mr. Walsh, then, transmitted this information to Mr. McHale. When the City Law Department sought possession of the historic artifacts, the Hazelwood demolition company maintained it was part of the salvageable materials from the demolition, and hence, the demolition company retains ownership of the Time Capsule and contents. The City Law Department is now looking into their legal options for obtaining control of the historic artifacts. The demolition company is consulting with their attorney. Kerlik, Bobby. "Brashear capsule donation sought by history center." Pittsburgh Tribune-Review 2015 March 26. Hasch, Michael. "Demolition of Brashear factory in Pittsburgh's North Side uncovers time capsule." Majors, Dan and Amy McConnell Schaarsmith. "Who owns the time capsule found at historic Brashear factory?" Pittsburgh Post-Gazette 2015 March 25.